I just finished this book a few days ago. What a terrific read! First off, let me say this is NOT for young children. I’d recommend this for about thirteen or fourteen and up (and not easily creeped out). That said, it’s obvious why this, and all of Sherlock Holmes, is considered classic literature. The story starts off with a murder. The victim looks like he died in agony. There is blood, a message written on the wall in German, meaning ‘revenge’. Sherlock Holmes investigates the scene, makes several deductions, and finds a small wedding ring, which he doesn’t tell the police about immediately. He places an add in the paper to lure the killer to his home, but is thwarted in his first attempt. The first part ends with the capture of the murderer, but not the mystery solved! Part two of the book takes you back in time telling, not only how the murder was committed, but why. Part two takes place mostly in America, with a man and his young daughter found out in the wilderness and saved from starvation by a large group of Mormons on their original migration westward to Utah. The man and his daughter do very well, yet never really are a part of the ‘community’. By this time, the daughter has grown up and falls in love with a man who is refered to in this story as a ‘Gentile’. The community leaders frown on this, threatening retribution unless the girl marries one of their own. Finally, the story comes full circle, back to England, and all of our questions are answered most satisfactorily. I didn’t want to say too much because the story is worth reading for yourself. As a writer, I appreciate taking the time to analyze how the author fed the reader clues, red herrings, and eventually delivered a satisfactory ending. Sir Arthur Conan Doyle is a masterful wordsmith, giving just enough clues to keep the reader interested, but leaving out important facts necessary to solve the mystery. Yet, the reader doesn’t feel ‘cheated’. If you want to write mystery stories, this is a good writer to study. If you just want a good mystery story, don’t miss this one. 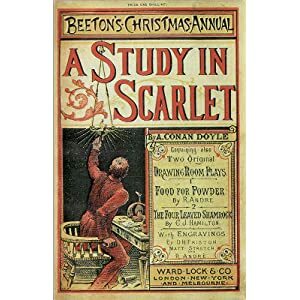 I just learnt of what a Mormon is after reading A Study in Scarlet. After my research. . . I never thought it was a religion! It’s sad, really. Doyle takes a very dark look at Mormonism history. Great story, though. I don’t often find myself rooting for the bad guy! hi .. this is kesava…….. from India . loved this book .i always admired works in detection .never really thought sherlock would do wonders, all his detection are simple but we fail to detect them and Sherlock’s chemistry thinking also was a admiring part . hi frds, its surbhi from india. Its a KANTASTIC novel written by Sir Arthur Conan Doyle. although i got holidays hw on a book review of any story book i wrote on about this…………. its an amazing story. A well played character by sherlock homes.